Nethserer is our domain controller and is used for employees to login to their Windows Desktops and Nextcloud using a common login id I’ve created in Nethserver. We use a common email address for our main mail. We have the business owners and 2 secretaries that will have access to this common mailbox. The two secretaries login to their computers using their Nethserver domain account but they will never have a need to send email from their own email accounts. On our previous email server they shared the login id and password to login to the general email account. On Webtop, is there a way for each secretary to login using their own domain user accounts yet in Webtop their personal email accounts are not seen. The only email I want the secretaries to see is the offices general email account. I’ve tried disabling email services for each secretary but this causes an error when they login to Webtop (obviously). Is there a way to have both secretaries login using their own credentials and only seeing the common email account our office uses? When assigning Sharing of email addresses for the owners I need to login to each account the owners need access too and enable sharing with the owners. I can see in the Webtop Administration each user account and the settings for each account. I would prefer that I could set Sharing from the Webtop Administration for each owner. Is this possible? We have also installed Nextcloud on our Nethserver. I see that Nextcloud has a contacts app. I would like to use Nextcloud as our offices main contact repository. To that end I would setup in Nextcloud all our client information (name, addresses and email addresses) and also setup groups. I want to use the Nextcloud contacts app as my main addressbook in Webtop so we can send emails to individuals and groups in Webtop using the Nextcloud Contacts app data. Please advise how can this be done? Webtop Administration > Cloud > Right click My Resources > Add Resource > Add Nextcloud Resource. The option to Add Nextcloud Resource is greyed out. I want to add Nextcloud for all users from the Admin. Is Nextcloud integration setup by user and not for our entire group? In fact all options when I’m logged in with my Admin account are greyed out. Is this normal? Thank you in advance for any help you can provide me. I would prefer that I could set Sharing from the Webtop Administration for each owner. Is this possible? it seems to me a good suggestion to evaluate as a Feature Request, what do you think @gabriele_bulfon ? I want to use the Nextcloud contacts app as my main addressbook in Webtop so we can send emails to individuals and groups in Webtop using the Nextcloud Contacts app data. Please advise how can this be done? you can try adding a link from a remote address book via CardDAV. you must add the authorization to the users or group of users to whom you want to activate this integration. Outstanding! I’m very impressed with what Webtop can do. Point #1 whereby the secretaries login with their domain ID yet their mail account points to our general mail account works perfectly. Just what we needed. I’m now looking into the Addressbook suggestion you provided. The link provides details on linking to a Gmail addressbook for an individual. My usecase is to create a global addressbook used by all Webtop users. Would I need to follow these steps for each Webtop (Nethserver) account with mail access to add in the Nextcloud Carddav Link or is there a way to add this Nextcloud Link for all users by group perhaps. Would be nice to use the Admin account to add a global addressbook for all users to use. I’ve noticed a difference between the layout of the Nextcloud Contacts and Webtop addresses. I’ve successfully added the Nextcloud Cardav link to Webtop based on the link you provided. And I’ve added a new contact to my local Webtop Addressbook. The resulting contact has a Title, Name, Company and email address in the Contacts to provide some detail about the contact. But the Nextcloud Contact is mixed up with regards to the Title and Name. The text of each Nextcloud Contact also looks a little lighter in colour or washed out and the icon looks funny as a blank circle beside the name. Is there a way for me to define within Webtop Addressbook layout so I can match more closely the sections of what’s in the Nextcloud Addressbook? Would there be a way to allow editing of the Nextcloud Addressbook from within the Webtop link to the Nextcloud Addressbook? Not a big requirement as we can always edit from wtihin Nextcloud but I thought I would ask anyway. I’ve also noticed when writing an email to multiple people, each client goes into a new ‘To’ line. Is there a way to add clients beside each other on one line. Other mail programs allow me to start typing a name whereby I select it, then a space is automatically added and I start typing another name and when I select that second name it goes beside the first name. This looks a lot cleaner to me than having a new To line for each name. I was also looking at themes for Webtop. I see some themes are available but I really like the Dark theme as my preference. Is there a site to download Webtop themes or a way to make my own theme? Thank you for your time and patience with all my questions. out of curiosity, can I ask you why you want to manage the contact list on Nextcloud and not directly on WebTop ? 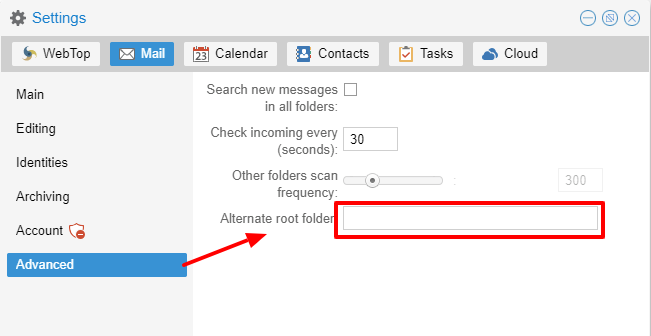 I confirm that currently there is a problem of matching the address book fields synchronized via CardDAV with Nextcloud. In particular the name is not synchronized but only the company. I did a test with Cardbook on Thuinderbird and CardDAV synchronization with Nextcloud works regularly by importing the right fields. What do you think @gabriele_bulfon and @matteo.albinola can you do something ? What do you think @gabriele_bulfon , can you implement for a future? There is no place to download additional themes but it could be interesting to produce a guide to be able to create new ones independently. What do you think about it @gabriele_bulfon ? Thanks again for your continued assistance with all my questions. As for my first question with using Nextcloud Contacts App as my main contact list. In my mind Nextcloud is my main repository for all my office documents. I also use Nextcloud for linking to external applications (external sites) so I’m pushing to have our office use Nextcloud as our central repo for everything. To that end I had thought it would make sense to have Nextcloud also manage all our contact information for our office and have our various apps (like Webtop) access this central repo for contact information. It would appear that using Nextcloud as our central repo for contacts is not going to work for us as I had hoped which is ok. I will switch gears and work with Webtop addressbook as our central repo for all contact information. To that end…what is the best way to have a global addressbook in Webtop that all mail accounts will have access too? Do I need to pick one of our mail accounts create an addressbook and allow all other users access to that addressbook? 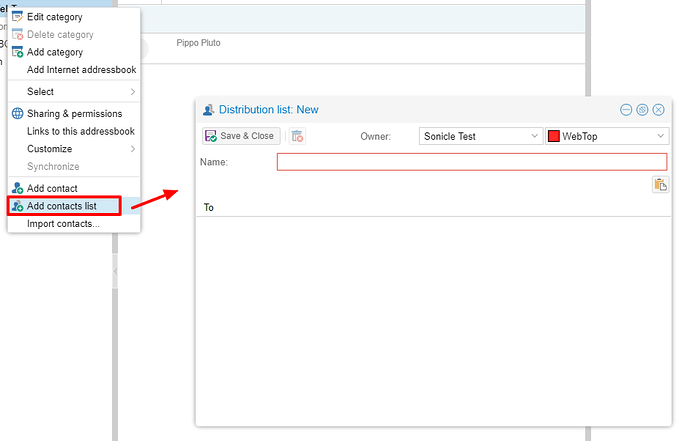 Or does Webtop allow for a global addressbook function through the Admin panel? I need to be able to grant access to the people who will need access to the addressbook. I may want some people to have access and others not have access. Generally all will have access but I’d like to have that option. I would prefer to have the ability to provide read or read/write access to users for this global addressbook. Most of my users should have read/write/delete access to update the addressbook but we do have 1 employee who will use the addressbook but will not have access to write/delete within the addressbook. In addition to individual client email/contact, I will also need to allow for groups to be setup in the global addressbook so that instead of typing in multiple email addresses we can use a group name that would contain all addresses the email is being sent too. I look forward to seeing my other suggestions for not having multiple “To” lines for sending emails and for being able to have more themes available. You can easily use a specific user who will become the owner of this address book, which you can then share with the individual users present in WebTop, deciding for each of them which permissions to assign.